Rocks and minerals are very different but yet alike in many ways. 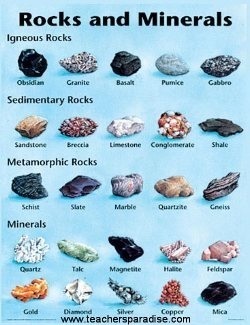 Minerals are what make up rocks and that is what you will be learning all about on these next couple of pages. You will learn interesting things about rocks for example that igneous rocks are made from lava and magma. You will also learn all about how they are made and what they are made of. With minerals you will learn all about different tests to tell minerals apart and different kind of minerals to!